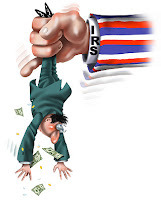 The Beantown Bloggery: Vote To Get Rid of Income Tax? This is what I get for not following politics at all. Apparently, there is going to be a vote to get rid of the state income tax!! The issue is whether to erase the state's income tax in two phases. The 5.3% tax would be sliced in half next year and then disappear entirely the following year. Advocates of repeal are hoping for support from voters worried about tough economic times and angered by bloated government spending. Six years ago, a similar proposal attracted 45% of the vote. This is awesome! Obviously I support this. Remember, I'm from Texas where they don't have income tax. It never benefited me since I had no income while I lived there - then I came here and got hit with the double whammy. From what I'm told, they make up for it in Texas by having higher property taxes. This creates another question I've always wondered about. Why should homeowner's get tax breaks that us renters don't? 7 Response to "Vote To Get Rid of Income Tax?" The real question is why do homeowners get taxed at all? Property tax is the only tax we have that is a tax based on the assets you own. Every other tax is based on money changing hands: income tax, sales tax, etc. Since homeowners are unfairly taxed to begin with, I think some good tax breaks are a good thing. I thought renters do get state tax breaks....no? The renter's tax breaks are not as significant as home owner's tax breaks, but they get them too. Dude, this is awesome. Not like I needed another reason to vote this year, but I'm totally there. Although, I don't actually make an income as a life long student, cutting taxes is and decreasing the size of the government is right up my alley. Property taxes are baked into rent... owners pass along the cost. So you'll see an increase in rent if property taxes rise - and a pretty steep one at that. Also, Texas has no tax because they have oil and gas revenue, which we don't. So we'll just see a huge budget gap - and you'll end up with less state police, worse roads, longer lines at the RMV... and higher sales tax, etc. The poorest will be hit the hardest, as usual. Well someone has already addressed the fact that renters do get something of a break for MA tax purposes (though not much of one considering the cost of rent). The real reason homeowners get tax breaks that renters don't is tax policy is used to encourage certain behaviors. The federal government wants to encourage home ownership because it provides for stable communities therefore it lets home owners deduct mortgage interest and property taxes. It's also true for businesses - there are lots of tax breaks (including credits, deductions and incentives) at the federal and most state levels. The R&D tax credit encourages companies to invest in research, thus providing well paying jobs. Do you have any idea how much is paid for by income tax revenues? thanks for mentioning the effort to repeal the income tax. Texas and many other states do not have income taxes. Repealing the tax will force our politicians to cut wasteful spending, or at least cut spending. The money that would have been taxed will still be in Massachusetts. But citizens, rather than politicians will choose when and how to spend it. Instead of money going to some bureaucrat who works from 10 to 4, it will go to a local entrepreneur. Visit http://www.smallgovernmentact.org/ for more info, to help out, and to donate. The last initiative in 2002 lost by only 5% of the vote. This year's initiative is polling dead even. Let's win it.